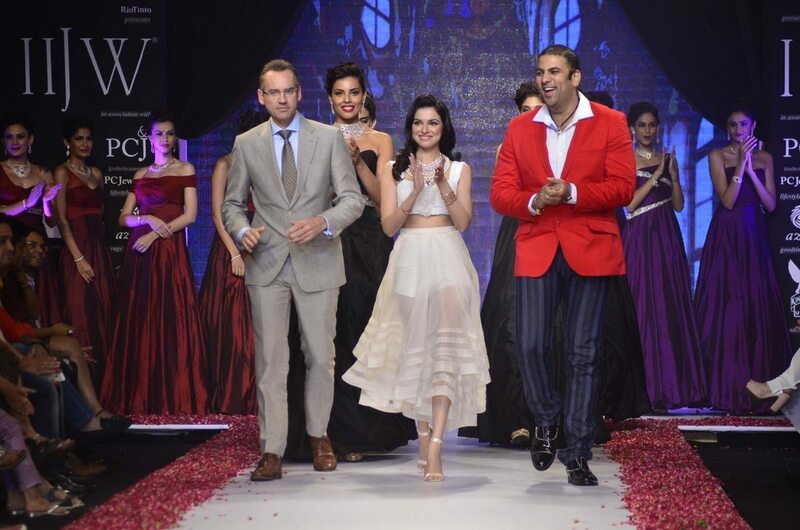 Divya Khosla Kumar looks her elegant best in white at the IIJW 2014. Actress turned filmmaker Divya Khosla Kumar walked the ramp for PN Gadgil Jewellers on day 2 – July 15, 2014 – of the India International Jewellery Week (IIJW) 2014. Divya was the showstopper and looked gorgeous in a white flowing outfit. Divya exuded a goddess like demure charm in her all white look, the multi layered pearl neckpiece paired with a gold bracelet was just the right combination for the showstopper. The International Jewellery Week event was also attended by Bhushan Kumar. The actress recently made her debut as a director with the youth centric film ‘Yaariyan’ – which hit the theaters on January 10, 2014. Divya was earlier seen in the movie ‘Ab Tumhare Hawale Watan Saathiyo’. Khosla is now all set to turn into a producer with the Ranbir Kapoor starrer ‘Roy’.